You are here: Home / Uncategorized / Give It Up Efraim Zuroff! When Holocaust deniers hunter himself falls into the category of genocide deniers then you really get a problem of pervasive moral decay being forced onto the world. After the International Criminal Tribunal for the Former Yugoslavia ruled that Srebrenica massacres (1995) was genocide, Efraim Zuroff, of Simon Wiesenthal Center, had said repeatedly that Srebrenica was not genocide but politically inspired mass murder of men and boys! That this genocide was not history but politics! It took two days for Efraim Zuroff, relentlessly pro-Serbia Nazi hunter, who shuts a blind eye to Serbia’s WWII Judenfrei (Jew-free) status through extermination of Jews by May 1942, to falsely accuse – once again – Croatia of fascism because of massive expression of love for Croatia that filled the streets of Zagreb on Monday 16 July 2018 when the national football team returned triumphant from Russia, FIFA World Cup 2018. 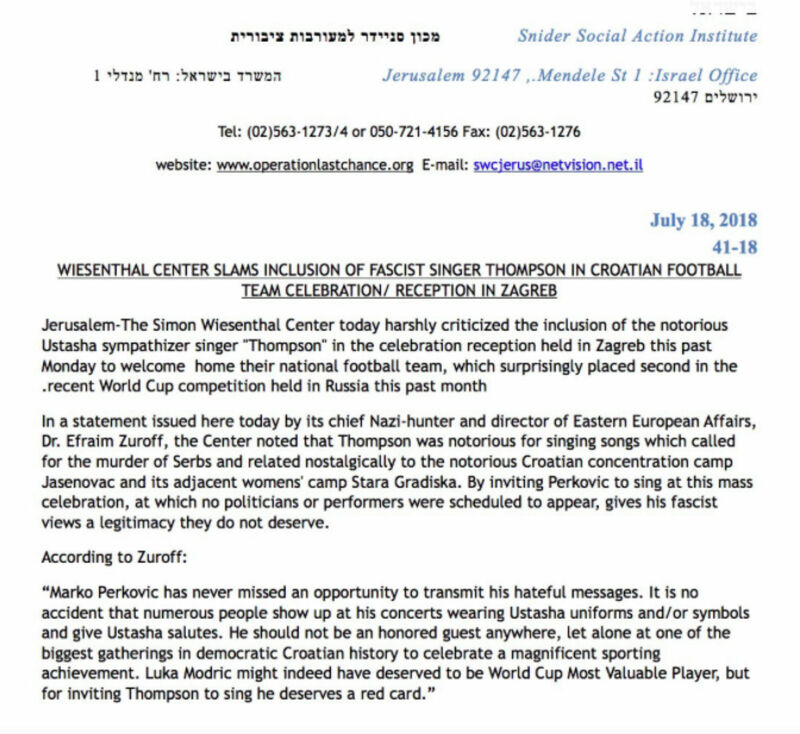 On Wednesday 18 July 2018, the Jerusalem Office of the Simon Wiesenthal Center issued a press statement condemning the participation of Croatia’s most popular singer Marko Perkovic ‘Thompson’ at the Croatian celebrations in Zagreb’s main square, Ban Jelacic Square,which gathered over 200,000 citizens, welcoming Croatia’s national football team back from FIFA World Cup competition. Zuroff is the one who spreads messages of hate, not Thompson. It is by no mistake or accidental omission that Zuroff gave no evidence to support his claims regarding Thompson’s messages or people wearing Ustasha uniforms at his concerts. Zuroff in his long-standing and baseless accusations of fascism on the rise in Croatia stands out as a professional bully when it comes to Croatia. Had Zuroff cared to examine the lyrics of Thompson’s songs then his claims would indeed be different. 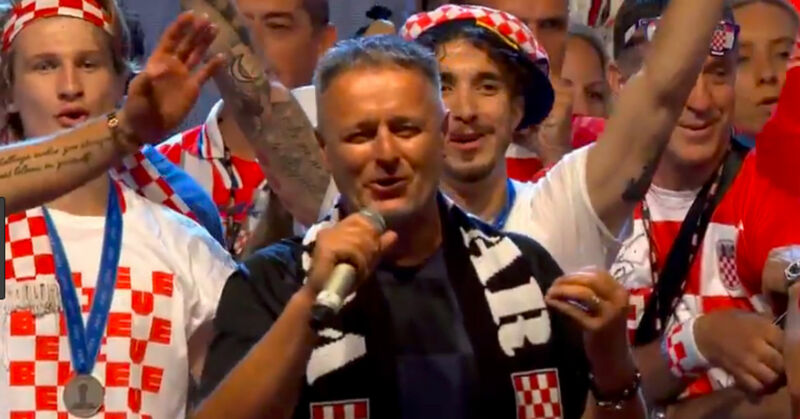 They would actually confirm self-preservation, love of freedom and independence, defence against aggression, love for Croatia, patriotism…the stuff most national musical hits throughout the world are made of. I am not even going into details here that there are no people wearing Ustasha uniforms at Thompson’s concerts. So it truly saddens the mind that some of the world’s mainstream media outlets simply published Zuroff’s statement without bothering to check the facts! There is no doubt in my mind that Zuroff simply cannot tolerate well the love and unity for Croatia expressed so freely and openly by its people. What happened in Jasenovac was a horrific crime against humanity. 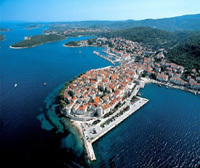 Since 1945 every Croatian generation has been enlightened about that camp. On Other hand, the Zionists are daily murdering Palestinian kids. I do not hear Efraim condemn it or the Israeli society. Efraim is a very ignorant man, Srebrenica was not the only massacre during the Bosnian genocide, Visegrad, Zvornik, were two Bosniak towns where the women and children were shot and thrown into the river. And yes Srebrenica was a genocide you can not line 8000 civilian men up and shoot them due to their ethnic background. What a weird man why will he be mocking Srebrenica ? in Srebrenica the girls were brutally raped before being put into the buses, so nobody left that town untouched. Efrain with his scary connections to Far Right Serb Nationalist circles should be the last one to speak about hate speech and ethnic harmony. If you google his name you will see his quotes about Srebrenica being used in Serb Propaganda blogs. All over Eastern Bosnia you have in the moment Serb war criminals in their best age walking around in the streets we are talking about thousands. It should be left to the imagination! Whose some of their anscestors did over 70years ago! Shame shame on him! Indeed, shame on him, Esther. Bien Ina! Toujours prête à répondre à l’injustice que subissent les croates dans monde. Idem à Bruxelles. Et puis ils s’étonnent de la recrudescence de l’anti – sémitisme en EU sur le déclin. Well said.. On a lighter note, I was willing Croatia to win in the final. They did so well. That is the truth: that day love and unity for Croatia were expressed by its people. Half a million people were on the streets. We were united, happy, filled with new hope, thanks to Zlatko Dalic and his team. There were no Ustasha uniforms there. We were simply proud Croats, why is that forbidden to us? But, for the sake of the truth, I must also say that Thompson is not at all our most popular singer and that he, unfortunately, represents more political than musical ideas. Maybe you haven t heard all his songs, Ina, or maybe you are right: we all, every group, every community, every nation, need higher level of tolerance, for others as well as for ourselves. There should be consequences for slandering Croatia and spreading hate of Croatia. The Croatian government (LOL) or perhaps an NGO could initiate legal proceedings against people and organizations that slander the Croatian people, spread hate for Croatia and other defamation of Croatia. 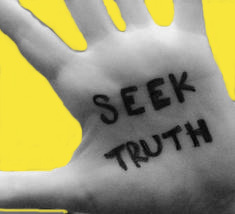 This would force an element of truthfulness and accountability. I am sure that a case could be brought before the European Court of Human Rights, UN or some other international judicial body or even Croatian domestic courts. Indeed Sunman there should be consequences,one is to mount a lawsuit for defamation and vilification etc and hit them where it hurts them most. I will share an insight that was experienced in 1988. Leaving Sydney airport, also on the plane was a late friend Zoran from Blato. Arriving in Belgrade , with snow everywhere, we missed the connecting flight to Dubrovnik. Had to stay overnight, so my friend asked me to come with him and stay at his uncle’s modest apartment. The man I met was Franko Separovic who had been living there since 1941. He was in his mid sixties and was the Vice President of the PTT the national postal network. During our conversations he said that in this Yugoslav regime a Croat was never allowed to lead any co-operative organisation or firm. Second position in the heirarchy was as far as any Croat could ever achieve. When the war started, his apartment door was broken through and he and his Serbian wife were murdered with gunfire. On the other side, there were many cases of Serbians that defended on the Croatian side in the homeland war for independence. The problem that blinds many is communism camouflaged today as globalism. Thanks for this Anto – it illustrates quite a lot. The term “holocaust denier” is used as a smear term against those researchers who have reviewed the forensic evidence at the camps, and then exposed the fraudulent, distorted and exaggerated claims of the promoters (“eye-witnesses”) of the official holocaust narrative. “So it truly sadensthe mind that some of the world’s mainstream media outlets simply ” = typo.